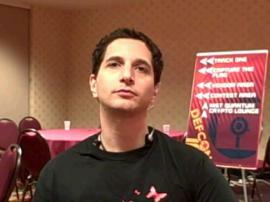 ICANN Hires Def Con Founder Jeff Moss as Security Chief ! Jeff Moss, the hacker better known as “The Dark Tangent,” has been named Vice President and Chief Security Officer of ICANN, the non-profit corporation that manages the Internet's names and numbering infrastructure. He is the founder of DEF CON, the world's largest conference for hackers, as well as the Black Hat security conference. A phone phreaker in his youth, Moss has recently worked as a white hat hacker, working to secure networks from attack. “He has the in-depth insider's knowledge that can only come from fighting in the trenches of the on-going war against cyber threats,” said ICANN president Rod Beckstrom in a statement. Moss is well known for having created the game “Spot the Fed” in which a hacker who thinks he's identified an undercover federal agent in the crowd at DEF CON can point him out, make his case, and if the crowd agrees, take home a coveted “I Spotted The Fed at DEF CON” t-shirt. Despite this, the Obama Administration appointed Moss to the Department of Homeland Security's Advisory Council. There are skeptics, however. Veteran ICANN watcher Milton Mueller questions why the organization needs to hire such a high-profile name.